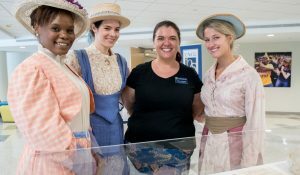 Last Tuesday, after hearing Chancellor Gilliam’s State of the Campus Address reflecting on the university’s past and looking toward the future, faculty and staff had the opportunity to learn even more about UNCG’s dynamic history – through a 125th anniversary-themed pop-up museum launched by Special Collections and University Archives during the traditional post-State of the Campus luncheon. The collection, displayed on the ground floor of Moran Commons, covered a 20-year time period, from the late 1880s through the early 1900s, and museum visitors were greeted by several UNCG graduate student actors in period costumes. “Looking at our past is a great way to start thinking about where we are today and where we want to be in the future,” explained university archivist Erin Lawrimore, who designed the pop-up museum and assembled the historical objects. On display were artifacts, photographs, publications and information focused on the founding of the university and what the State Normal and Industrial School was like 125 years ago, including a 1900 key to the president’s office in Main Building (Foust) and an 1891-92 prospectus outlining courses. A separate exhibition room displayed physical education gym suits from the 1900s,’30s and ’60s, a nurse’s uniform from 1963, a class jacket from 1961 and a 1942 drum signed by the Woman’s College Darlinettes – a recent University Archives acquisition making its public debut. Also on display was a typewriter used by alumna JoAnne Smart Drane, among the first African American students at the college. There was also a five-banner display that highlighted many key moments in UNCG’s history reflecting opportunity and excellence, and a looping video of historical footage. The online collections and resources are on the University Archives website. Digitized materials include yearbooks, student newspapers, course bulletins, Charles Duncan McIver’s papers and many print photographs. There are other University Archives online resources such as Encyclopedia of UNCG History, the Spartan Stories blog, social media outlets like Facebook, Twitter, Instagram, and Tumblr and a YouTube Channel with historic video. From October through May, there will be a university history exhibition in the Hodges Reading Room in Jackson Library.